Most Melvindale folks occasionally have days when they've got a bunch of errands to run. Yesterday was my day off and I needed to fill the gas tank, pick up some groceries at my Melvindale market, swing by the ATM and get the kids from school. I could have made four trips . . . but that would have been totally inefficient. Instead I got unusually organized and planned my stops. I hit the ATM first and got gas next. Then I went to the supermarket and picked up the kids on the way home. I was proud of my wise use of time and money. What does this have to do with your car? Well, back in the day, each of your engine's accessories, like the alternator and air conditioner, were powered by separate belts. A vehicle might have five or six belts. These days, vehicles have a single belt to run all the accessories. It's called the serpentine belt. A pulley attached to the vehicle engine's crank provides the power to turn the serpentine belt. 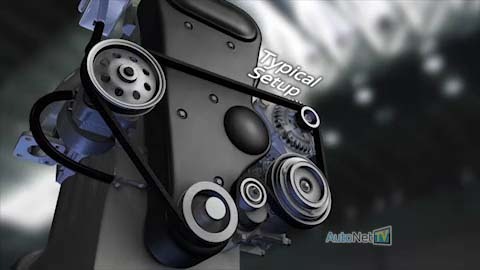 On the engine in the video, the first accessory in line is the power steering pump, which makes it easier to steer your vehicle. Next comes the alternator which powers the vehicle's electrical system and charges the battery. Then the air conditioning compressor. This helps make cold air to keep you comfortable all summer long in Melvindale. Finally, we come to the belt tensioner. Its job is to apply pressure on the belt to keep it tight. Then, back home to the crank. This is a pretty typical setup, but it can vary somewhat. In some vehicles the water pump or radiator fan or the power brakes are also run by the serpentine belt. Some even have two serpentine belts. No matter how your engine is laid out, you're not going far without a serpentine belt. Your vehicle manufacturer has a recommended interval for replacing your belt and your Melvindale Car Care service technician can inspect it for damage or wear. Several years ago, manufacturers started making serpentine belts out of a new material. It's much more durable, but it's harder to tell when the belt needs to be replaced. The old style belts would crack and chunks would fall off so you could easily see when you needed a new one. On the new style belts, if the ribs wear too deep, it's time to replace. Your Melvindale Car Care technician uses a simple gauge to tell when the belt is worn. A worn belt stresses your vehicle engine's expensive accessories and causes them to wear prematurely. So, change your serpentine belt and belt tensioner according to your manufacturer's recommendations to extend the life of your accessories and to prevent future breakdowns.